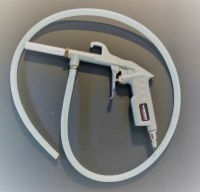 This siphon spray blow gun is perfect for those projects where you need to spray liquids. Simply connect your air compressor hose to this blow gun and put the hose in the liquid that you wish to spray. Great for cleaning engines and spraying liquids It blows away grease, dirt and messy soiled surfaces. You can apply coatings with it as well. KIT INCLUDES: Durable air blowgun made for liquids and 3-feet of 1/4" siphon tubing. Max psi 90 psi for water and 30 psi for other liquids.